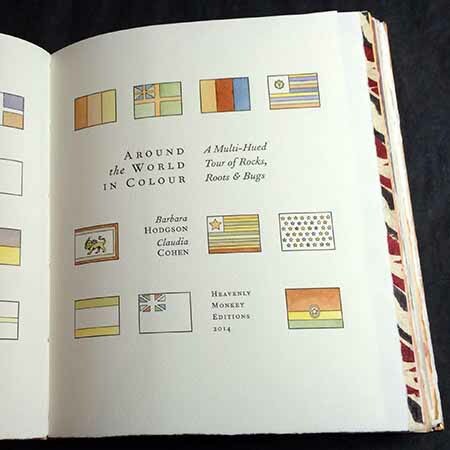 Having previously examined the history of colour systems and the role of colour in play and in work, author/designer Hodgson and binder Cohen circumnavigate the globe for the fourth and last book in their colour series, focusing on colour sources, including annatto from Brazil, lac from India and indigo from southeast Asia and Nigeria. The text—23 short essays on the raw materials of traditional colours — is set in Monotype Fournier and printed letterpress by David Clifford of Black Stone Press. Two hand-coloured maps and a bibliography accompany the text. Interleaved throughout the text are 19 full sheets of paper (a combination of kozo and Reg Lissel’s handmade paper) richly dyed by the authors for this project, using some of the materials discussed. Text pages are embellished with swatches of European ochres and authentic vermilion, cinnibar, lapis lazuli and Alexandrian blue. Around the World in Colour (octavo, 54 pp.) was issued in a clamshell box houses the book and a booklet of paper samples, along with a piece of lapis lazuli and vials of dyestuffs. As with the previous titles in the series, the first eight copies from the edition of 30 form a special issue, extra-bound in full leather with a piece of original art from the project included.